It’s purpose is to encourage and assist the study of Local History as an academic discipline and as a rewarding leisure pursuit for both individuals and groups. Dedicated to preserving the history and development of our village. Their aim is to help meet the needs of anyone with an interest in local history. 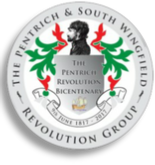 South Wingfield in Derbyshire is a special place because it is the place where much of the Pentrich Revolutionaries originated. Read all about the History of South Wingfield here. Established in 1966 to foster the study of local history and research into all aspects of the history of Ilkeston and the district and to disseminate this information for the benefit of the public. Promotes the collection, preservation and use of recorded memories of the past. Link to the English Heritage Web site entry for Wingfield. This is a Society, committed to archiving material such as photographs, maps, artefacts, indeed anything which is connected to village life. As a registered charity the committee has a responsibility to ensure that we preserve these valuable items for future generations. Heanor, (in case you are just browsing and don’t actually know), is a market town in Derbyshire, England, very close to the border with Nottinghamshire. Not a major tourist area, but we are here to celebrate our history and heritage, which is as strong as anyone’s! We hope you find our site both interesting and informative. This site is under constant change - most pages stay the same, but almost every month there are new additions, and eventually some items will disappear. Please keep coming back to see what changes we have made. If you’ve not visited for a while, have a look at the What’s New page, where we keep a running log of changes made to the site. Ripley and District Heritage Trust was founded in 1993 with the aim of collecting and conserving documents and artefacts relating to the history of Ripley and district. The original committee collected thousands of items and displayed them in premises in the town centre. In 2003, the collection was put in storage. Now a new committee is beginning to catalogue the collection and hopes to arrange limited public access and to continue the work begun of protecting the town’s heritage. Sylvia Mason’s project to create a family tree for each of the families involved in the Revolution, from as far back as she can find, to present day. Each tree will be turned into a book and the descendants of that family will be able to purchase them for the bi-centenary of the Revolution in 2017. The Friends of the Cromford Canal is a charitable organisation whose aim is to see the restoration of the historic Cromford Canal for the benefit of the general public.